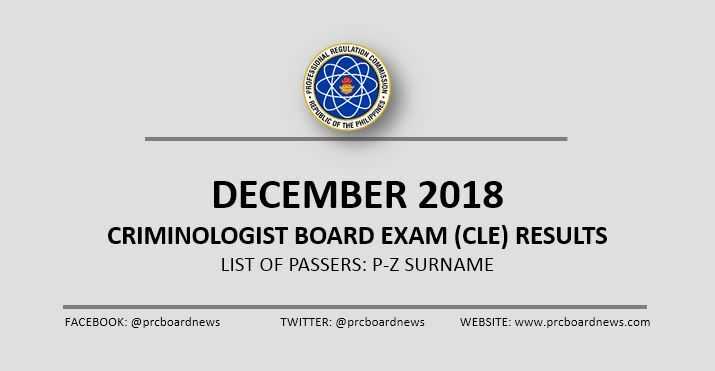 MANILA, Philippines – The Professional Regulation Commission (PRC) announced the full result of December 2018 Criminologist board exam or Criminology Licensure Exam (CLE). View on this page the list of passers, P-Z surname, as released on Saturday, January 12. PRC and the Board of Criminology administered the CLE on December 14, 15 and 16 (Friday to Sunday) in Manila, All Regional Offices, Zamboanga, General Santos and Rosales, Pangasinan. PRC said that registration for the issuance of Professional Identification Card (ID) and Certificate of Registration will be done on-line. Visit the official website of PRC (online.prc.gov.ph) and follow instructions for initial registration. The three-day exam covered the following subjects: criminal jurisprudence, procedure and evidence and law enforcement administration; criminalistics, crime detection and investigation; and sociology of crimes and ethics and correctional administration. .. Im willing to wait whatever the result,, but im hoping for the good, in jesus name Amen!